Persona Non Grata: Head Up Your Phone? California, the bellwether state, has issued a health warning for radiation emitted by cell phones. Not surprising to US Person, as most millennials he sees around him go through life with their heads bowed before tiny, brightly lit screens. [photo] Cell phones emit radio frequency energy (RF) to receive and send signals to cell towers. 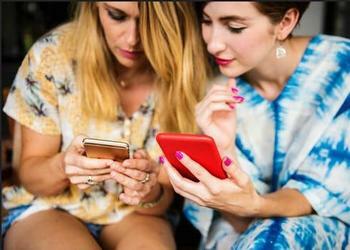 Although the scientific community has not reached a consensus on the risks of cell phone use, research suggests long-term, frequent use may impact human health. The World Health Organization has classified RF fields as possibly carcinogenic to humans. Specifically a type of malignant brain cancer, glioma is associated with wireless telephony. Besides cancer, RF has been shown to reduce sperm count and motility, too. About 95% of 'Mericans own a cell phone. The average age for acquiring their first one is ten years. The California Department of Health suggests you keep your phone in your backpack when not using it, or better yet turn it off since the device tries to stay connected; send text instead of voice so you do not have to hold your phone next to your ear; keep it away from your head when accessing the Internet or loading files; use airplane mode when viewing downloaded videos; and lastly do not sleep with your fascinating electronic placebo!